Reiterating his firm commitment to serve the people of state, the Punjab Chief Minister Parkash Singh Badal today said that people of Punjab were his biggest ‘asset’ and he would leave no stone unturned to ensure their welfare.Addressing the gathering during Sangat Darshan program of the Lambi assembly segment here today, the Chief Minister said that due to the love and affection of the Punjabis he had became the Chief Minister of the state for the record fifth term adding that he was making all out efforts to fulfill the aspirations of the people. Badal said that he would continue his endeavors to ensure all round development of the state and prosperity of its people. He said that in order ensure the holistic development of state and well being of its people, their government had formulated a number of welfare schemes. The Chief Minister said that his top priority was that every person in the state should get food, due to which they had launched Atta-Dal scheme a few years back under which the beneficiaries were given Atta and Dal at subsidized rates. He said that to ensure that more and more population was covered under this scheme, now they have decided to double the beneficiaries of this scheme from existing 16 lakh to 32 lakh and even the rate of Atta would be slashed to Re 1 to Rs 4 per kilogram. Badal said that the eligible beneficiaries would soon avail the benefits of this scheme.Slamming the Congress led UPA government at the centre, the Chief Minister said that due to its wrong and irrational policies the agriculture has been ruined. He said that the exorbitant hike in cost of agricultural inputs coupled with the non remunerative MSP of crops has broken the backbone of the farmers. 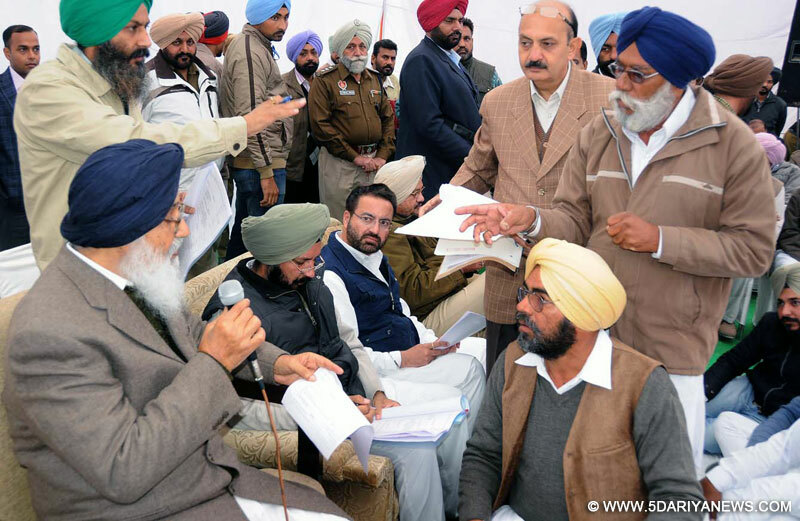 Mr. Badal also advised the farmers to adopt the technique of using the farm equipments on custom hiring basis to curtail the heavy cost expenditure meted out on farming. He said that the state government was already giving 30% subsidy on this project. “Adopting this technique will not only reduce the cost of farm input but will also enhance your profits” he added.The Chief Minister said that the Congress has always meted out step motherly treatment to the state due to which it has lagged behind in the process of development. He said that need of the hour was to constitute the NDA government at the centre with Mr. Narendra Modi as the Prime Minister of the country. Badal said that the state would witness an era of unprecedented development and prosperity if Mr. Modi becomes the Prime Minister of country.Later on interacting with the media persons, the Chief Minister said that the problems of the Lambi assembly segment were different from the others parts of the state due to which the government was laying special focus on it. He said that as majority of the area of this segment was water logged so the problems of the people were understood after visiting each and every village. Reiterating that Sangat Darshan was an integral part of the governance of the state government, Mr. Badal said that he would continue this pro-people initiative even in the future also. Relying to another query, the Chief Minister said that the upcoming Tata Memorial Cancer hospital at Mullanpur near Chandigarh was a result of the persistent efforts of the state government. He said that they had always desired to open a big cancer hospital in the state for facilitating the cancer patients, due to which this hospital was coming into existence. Mr. Badal said that he had personally requested the Prime Minister Dr. Manmohan Singh to lay down the foundation stone of this prestigious hospital after which he had agreed to lay down its foundation on December 30. On the occasion the Chief Minister welcomed a number of Congressmen who had left their party to join the Shiromani Akali Dal. The Chief Minister was accompanied by his Special Principal Secretary Mr. KJS Cheema.